Mani's menu — with specialties from India, Nepal, Bhutan and Tibet — traces the unusual journey of the husband-and-wife team who opened this welcome addition to eclectic Pinehurst. It was a month before Christmas, but a 4-year-old was singing “Jingle Bells,” prancing and dancing alongside his parents’ table as they finished the last of their curry at Mani’s Kitchen. These antics could have been problematic in a busier restaurant, or one not presided over by a mom and pop who have two kids themselves, a son who is a recent UW grad and a daughter in high school. But the handful of customers at Mani’s on this November weeknight looked on indulgently, as if we were all doting uncles and aunties. “I am very glad you are here,” Sheila Chhetri told the youngster, pausing on one of her walk-bys bearing plates to and from the kitchen. She governs the dining room of this tidy establishment, waiting tables and fielding takeout orders. Her husband, Mani Chhetri, rules the kitchen. They constitute the entire staff right now, but as word spreads about Mani’s vibrant curries and soul-restoring Himalayan specialties, they will likely need more help. Mani’s is just over a year old, but the couple are no strangers to the Seattle restaurant scene. For 12 years, they owned New India Express on Capitol Hill. They sold it last year, but Mani wanted to continue catering and his search for a suitable kitchen led them to buy a rundown Indian restaurant next to a pizzeria and a Pakistani deli in a strip mall in North Seattle’s Pinehurst neighborhood. They refreshed the space with white wainscoting and orange walls. Glass tops protect the black tablecloths. Orange silk flowers sit on each tabletop. The art and memorabilia on the walls recall their faraway homelands, where each still has family: she in Nepal, he in Bhutan. Both 53, they met as children at a Christian missionary boarding school in the Darjeeling province of India and married in 1989. Marriage to a nonnational complicated Mani’s promising career in one of Bhutan’s largest corporations, so they settled in Nepal and he went off to Bombay to train for a job in hotel management. Things got dicey during Nepal’s civil war and he was compelled to flee the country, alone. After years in refugee camps, he gained asylum in America in 2001. Three years later, Sheila and their two children joined him in Seattle. Mani’s menu traces the trajectory of their lives. Curries and other Indian dishes comprise the bulk of it. If you are in a rush, look to those because, as Sheila is quick to caution customers, the made-to-order Bhutanese, Nepali and Tibetan specialties take longer to cook. If you’re not in a rush, though, considering ordering momos (dumplings), thukpa (noodle soup) or ema datchi (chile-and-cheese stew). While you’re waiting, start with a curry or an Indian appetizer sampler. The sampler holds two crispy samosas — one filled with savory ground beef and peas, the other with peas and mashed potatoes — as well as delicately battered and fried pakoras fashioned from chicken tikka, cheese or cauliflower. Two chutneys — tamarind and yogurt-mint — accompany those bites, joining the fiery ginger-tomato chutney that everyone gets as a gratis opener with a basket of Tostitos. The curry selection is lengthy. Lamb, chicken, seafood and vegetables are all well represented, with nearly a dozen variations on sauces. There is no pork on the menu, in deference to their many Muslim neighbors in Pinehurst, whom they want to feel welcome here, but there is goat. 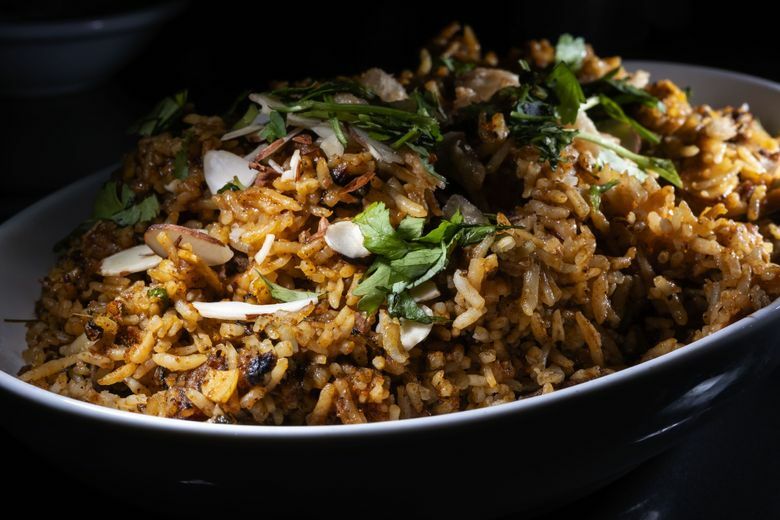 Morsels of the musky meat are generously distributed in a hearty biryani (rice pilaf) studded with raisins, currants, almonds, cloves and cardamom pods. If goat’s not your thing, I’ll bet it’s just as stunning with lamb. Lamb curries offer fork-yielding meat that might be submerged in pale, cilantro-laced coconut milk or, as lamb bhuna, smothered in a thick gravy bright with tomato and mint. Almonds sweetened the sauce for shrimp korma, a yogurt-based curry typically made with cashews. Though the tightly curled shrimp were overcooked, I wanted to take a spoon to the delightful sauce. All the curries have a built-in, slowly blossoming pungency from a blend of spices and aromatics — among them cumin, coriander, cardamom, cinnamon, chili pepper, garlic and ginger — but dishes can be made even hotter if you wish. 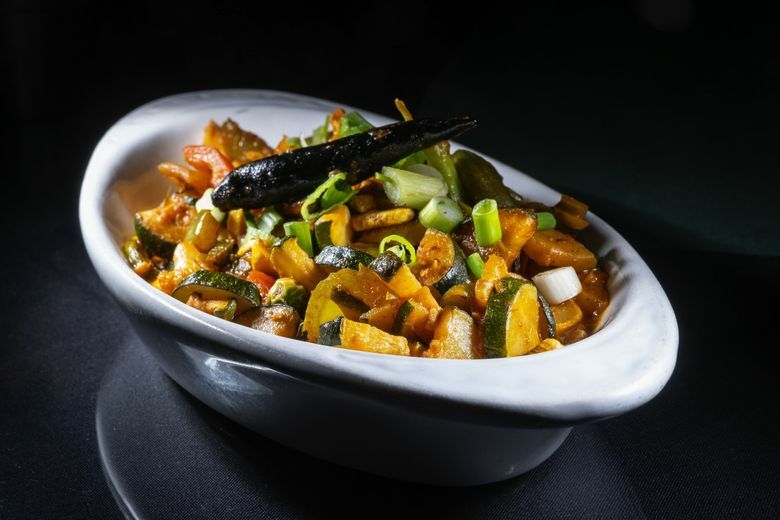 For a meatless curry, consider vegetable zalfrazi. The name means a mix of colorful things and this stir-fry of green beans, squash, peas, broccoli, cauliflower, onion and bell is certainly that, with lots of garlic, cumin and chili pepper in its tomato-based sauce. Eggplant bharta, a dense purée of roasted eggplant with peas, needed salt to bring out its complexity. Handily, a salt shaker and matching wooden pepper mill sit on each table. The Tibetan momos, crescent-shaped dumplings with a high pinched ridge, are worth the 20-minute wait. Ginger and garlic put zip in the minced chicken filling. Both are also a vigorous presence in the Tibetan chicken noodle soup, thukpa. It makes sense that people who live in such steep, mountainous terrain would come up with soups and stews that both succor and excite. Ema datchi is a rich Bhutanese stew of potatoes, daikon and many kinds of mushrooms. The name translates as chile cheese, because that’s what’s in the sauce. You may add beef, chicken or vegetables to it. It was terrific with chicken. 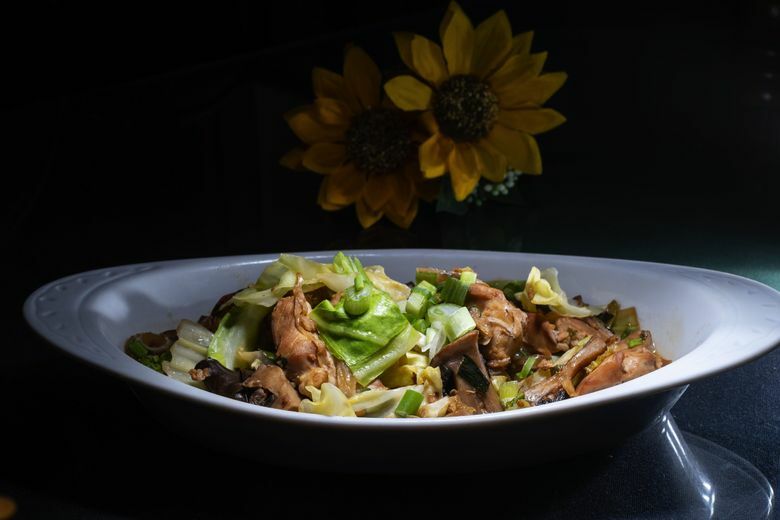 According to Mani, most traditional Bhutanese dishes rely on meat, cheese and mushrooms, fresh vegetables being scarce in that mountainous country, but you’ll find lots of bright green cabbage in pha, another sturdy stew that is a lot like ema datchi, minus the cheese.